C3 Corvette "Life in the Fast Lane"
Highly detailed artwork in smaller scale of the C3 Corvette badge script and emblem on the front left of chest, in factory colours and detail. 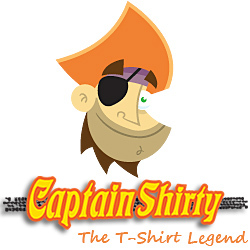 The smaller artwork on the front of this T’shirt has the C3 Corvette racing flags badge emblem in factory colours, with the ‘Corvette” script below the badge emblem, in “chromium” appearance. No vehicle artwork is on the front of this Tee. The artwork is of two C3 (circa 1978 through to 1982) Corvette coupes, introduced by Chevrolet. Firstly, in the forefront, we have this beautiful red tyre frying 1982 C3 Corvette coupe with brilliant attention to detail. The accuracy in detail of those highly polished sports wheels, white lettered ‘Goodyear’ tyres & glass top. Check out that burnout! This artwork is scaled brilliantly...cool custom number plates! Behind in the artwork background we have a sleek 1979 white C3 Corvette coupe at ¾ rear view, detailed with those beautiful polished Chevy Rally wheels, white lettering on the tyres, and that unmistakable front guard “gill”. Brilliant attention to detail with the light reflections and shadows. Note the image above clearly shows the white 1979 Corvette with the standard factory sports wheels, yet this artwork version was deleted before time of print on this artwork, hence the Chevy Rally wheels can be seen. 1979 saw a new front nose emblem and gas lid emblem. Cross flags were the exterior adornment for 1979. The interior received the clamshell seats that were similar but not quite the same as those on last year’s pace car. The pace car spoiler package was carried over as optional equipment and the car was just a great all around sports car. 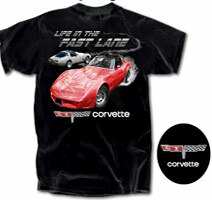 The background of the Tee illustrates the main C3 artwork Corvette performing a tyre frying burnout, with the smoke effect forming part of the main script ‘Life in the Fast Lane’. This script is white and silver in colour, giving the impression of being at speed. Below the large artwork is the C3 Corvette badge emblem in correct colours and detail.